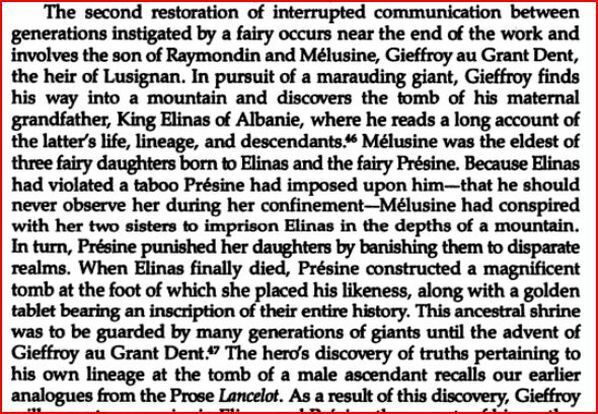 Melusine's 'Magickal' DNA & The Royal Houses of Europe: Regarding the legendary line of Frankish kings known as the Merovingians, it will be recalled that the mother of their founder Merovee (or Meroveus) was believed to have been raped by the Quinotaur: a mythical sea-bull. The Merovingian Mythos, is related to the narrative of Melusine, and specifically, in her non-fictional incarnation as Melisande, the mother of Fulk V, Count of Anjou and daughter of Baldwin II. In this context, Melusine's Bloodline is attributed with uniting the Merovingian house with the line of Anjou; and thus to the Plantagenets who would produce several English monarchs. Both stories share an identical theme: of legendary sea-creatures giving rise to powerful bloodlines. An even earlier rendition of the Quinotaur/Melusine legend is the ancient Phoenician tale of Europa and the bull. Here again, a sea-bull ravages a maiden of high birth. Europa is the daughter of Canaan, the son of Poseidon. We should also note that the goddess (or princess) Europa is the source of the name of continental Europe; and that the image of Europa and the bull -- which corresponds esoterically to the Quinotaur and his quarry -- is widely used on EU documents, and Euro coinage. The same symbol can be applied to the Merovingians, and -- through Melusine -- to the Angevin line and the House of Lorraine (Hapsburgs). Author, Jean D'Arras wrote his major work "Chronique de Melusine" in 1393 after being commissioned to do so by the Duke of Berry. According to history the Duke of Berry was so fascinated with the story of Melusine, that his sister Marie (Duchess of Bar/Berry) told D'Arras to record all the information that he could find on Melusine to please her brother the Duke. D'Arras spent numerous years researching and collecting information which followed William de Portenach's previous stories of Melusine. In 1478, D'Arras' last work Le Liure de Melusine en Fracoys was published posthumously. According to the book, "The Serpent And The Swan: The Animal Bride In Folklore And Literature," the name "Melusine" was used by D'Arras and Couldrette as an abbreviation of the words 'Mere des Lusignan' or 'Mother of the Lusignans.' Many other derivations of the name Melusine were suggested pairing the fairy story with Greco-Roman deities and even Celtic origins. Another thought argued by Markale was the latinization of the greek words, "Melas-Leuke" meaning "Black and White." So, pretty much the story of Melusine is one that defines double-nature meaning she was human and animal, good and evil, both male and female. The male and female part is weird, I know, but according to the stories the fact that she was fish-like or serpent-like gave the idea of her upper half being more feminine while her lower half was more phallus-like. Melisende de Lusignan, Princess of Antioch (1200 Holy Land- after 1249), was the youngest daughter of Queen Isabella I of Jerusalem by her fourth and last marriage to King Amalric II of Jerusalem. She had a sister Sibylla of Lusignan, a younger brother, Amalric who died as a young child. By her mother's previous marriages, Melisande had three half-sisters, Maria of Montferrat, who succeeded their mother as queen of Jerusalem on 5 April 1205; Alice of Champagne, and Philippa of Champagne. Marie of Antioch (died after 10 December 1307), she was childless. Melisende protested the succession of her nephew King Henry I of Cyprus as Regent of Jerusalem on the death of her half-sister, Alice in 1246. Alice had been Queen-consort of Cyprus and regent of Jerusalem for Conrad IV of Germany. She died sometime after 1249. Upon the childless death of her only surviving daughter, Marie sometime after December 1307, the direct line of Melisende became extinct. Her half-sister Maria's line died out in 1268. Antioch was captured in 1098 by Bohemund of Hauteville originating from Apulia and son of Robert Guiscard. Bohemund founded a principalty independent from Byzantium against the wishes of the Emperor Alexius who had wanted to reunite the territory to the Byzantine Empire. Instead the principalty became a de jure vassal of the Patriarch of Jerusalem and later of Baldwin of Bouillon who had been crowned king by the Patriarch. After the fall of Edessa in 1144, Antioch was attacked by Nur ad-Din during the Second Crusade. Much of the eastern part of the Principality was lost, and Raymond was killed at the battle of Inab in 1149. His successor, Raynald, immediately found himself in conflict with the Byzantines, this time in Cyprus; he made peace with Manuel I Comnenus, however, in 1158, and the next year Manuel arrived to take personal control of the Principality. Henceforth, the Principality of Antioch was to be a vassal of Byzantium until Manuel's death in 1180. Although this arrangement meant that the Principality had to provide a contingent for the Byzantine Army (troops from Antioch participated in an attack on the Seljuk Turks in 1176), it also safeguarded the city against Nur ad-Din at a time when it was in serious danger of being overrun. At his death Raymond III bequeathed the County of Tripoli to Bohemund III. Bohemond III's death resulted in a struggle for control between Antioch, represented by Bohemond of Tripoli, and Armenia, represented by Bohemond III's grandson Raymond-Rupen. Bohemond of Tripoli, as Bohemond IV, took control by 1207, but Raymond briefly ruled as a rival from 1216 to 1219. Bohemond died in 1233, and Antioch, ruled by his son Bohemond V, played no important role in the Fifth Crusade, Holy Roman Emperor Frederick II's struggles to take back Jerusalem in the Sixth Crusade, or Louis IX of France's Seventh Crusade. In 1268 the city was captured by the Mameluks and Bohemund VI retired to Tripoli which fell in 1289. From that time there only have been titulary Princes of Antioch. 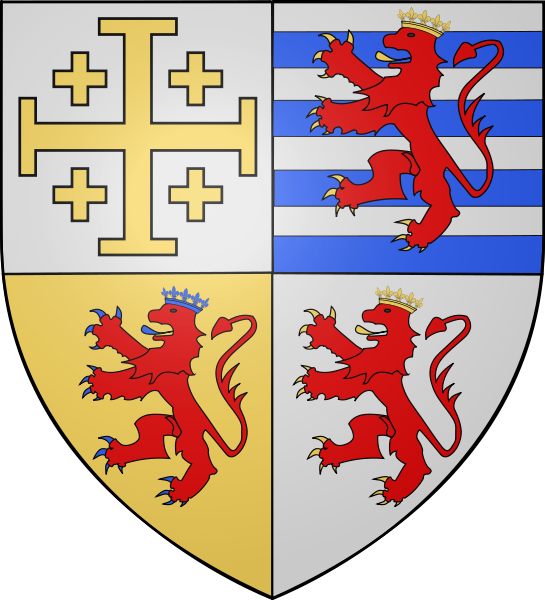 In 13th century sources the arms of Antiochia are described and given as Argent, a lion Gules. Their origin may be in Byzantium of which the Prince of Antioch was a (nominal) vassal. Protovestiarios of Michael VII Parapinaces. Such a red lion was probably also adopted by Raymond of Poitiers and the House of Poitiers in general, as a red lion was the arms of the Count of Poitou until the mid-13t century. In Antioch the red lion can be traced back with some certainty to Bohemond IV whose son Henry married Melisende de Lusignan. Their son Hugues III of Cyprus combined the arms of Lusignan with a red lion. The red lion on a white field can also be found on a stone, today in the Museum of Cairo. In French history, many royals all the way back to the days of Charlemagne have claimed to have descended from Melusine's family lineage....furthermore, there have been more than one royal damsel with the name Melisende (ie Melusine).... In fact, the Plantagenet families, Angevin lineage and the House of Anjou and Vere still claim lineage that date back to the story of Melusine. WAS THERE A REAL MELUSINE? One of the 'Royal Melusine's' in history, was married to Fulk V (Foulques V), the Count of Anjou. According to legend, King Richard I (Lion Heart) had once made comments of his ancestor Fulk III (Fulk's grandfather) saying "We come from the Devil, and to the Devil we shall go. "- meaning that because the story of Melusine had been attached to evil, cursed or even perhaps the spawn of the devil that the family bloodlines were tainted. It was said that the Plantegenet line, Angevin, Vere and Anjou lineage all went back to the Melusine story. Even prior to the marriage of Fulk V and Melisende there had been rumored legends of ancestry to a mythical fairy that resembled Melusine's story. According to historical evidence, Melisende was born the daughter of King Baldwin II of Jerusalem (whose ancestry came from Rethel, France) and her mother was Morphia (daughter to Prince Constantine I of Armenia). Baldwin deferred to King Louis VI of France to recommend a Frankish vassel for his daughter's hand. He then in turn recommended a rich crusader and military commander, and possibly a threat to Louis VI himself, the Count of Anjou, Fulk V.
Melisende married Fulk Anjou V (Count of Anjou) and bore a son Baldwin III whom the King wanted to to make heir to the throne. In 1131 upon the untimely death of her father, Melisende became Queen of Jerusalem and co-ruler with her husband. Contemporaries of Melisende who did rule during the same time included Urraca of Castille, Empress Matilda (wife of Geoffrey, son of Fulk V-Count of Anjou) and Eleanor of Aquitaine. She proved to be a mighty ruler and a very strong minded and intellectual woman. She watched over her son and helped him rule over the land, although not without complications. Her strong will and "matriarchal" tendencies truly left a legacy of her motherly care and determination to take care of her son and her people no matter what, even at the cost of upsetting her son's feelings. SO WAS MELUSINE A SERPENT OR A MERMAID? "A MELUSINE is a typical illustration of a twin-tailed siren or mermaid. This creature is associated with numerous stories and legends, and is imbued with symbolic meaning in alchemy. The most common iteration of the siren is as Melusine, a creature from medieval legend. 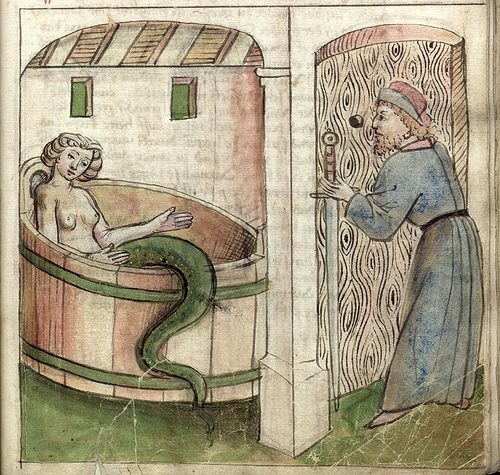 Melusine (sometimes, Melusina) was, according to legend, beautiful woman with a disturbing tendency to transform into a serpent from the waist down while bathing; it is the discovery of this nature that triggers calamity. As the story is most often told, the cursed maiden is discovered in the forest by Raymond, the Duke of Aquitaine, who begs her to marry him. She agrees, on condition that he never disturb her on a Saturday, when she bathes. Raymond eventually grows suspicious of his young wife, and spies on her- and his shocked reaction to her true appearance reveals his betrayal to Melusine, who transforms herself into a dragon and departs in a shrieking fury. This story can be viewed as a metaphor for sexuality, and the contradictory duality of the female nature as viewed through medieval lore and esoteric doctrines. In fact, it is the same dual-nature (ie esoteric Dualism) symbolism, that is found in the ancient esoteric school of alchemy...the use of the siren / mermaid as a more benevolent emblem of enlightenment- the siren of the philosophers. Alchemically, the siren’s two tails represent unity -of earth and water, body and soul- and the vision of Universal Mercury, the all-pervading anima mundi that calls out and makes the philosopher yearn to her." Melusine de VER has also been known as Melusina, Melouziana de Scythes, Maelasanu, and The Dragon Princess. She entered literary history in the book Roman de Melusine written in 1393 by Jean d'Arras. The story is a mix of fiction and fact, commissioned by the Duke de Berry, a French noble who was brother to King Charles V, and uncle of King Charles VI. 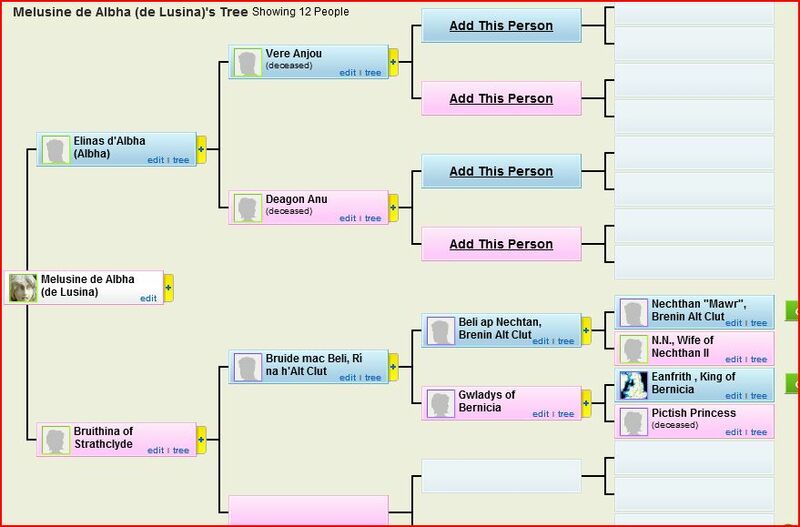 It was meant to be a family history and to uphold the proprietary claims to Lusignan and Anjou. In this story Melusine's mother was a Presine fairy who charmed Elinas, the king of Scotland. The result was their daughter Melusine. Half fairy and half princess, Melusine wandered over to the Continent and eventually met up with Rainfroi/Raymond in the forests Anjou. They met while he was out boar hunting. Overcome with her beauty, he took her hand in marriage, and many adventures ensued. As a result of this book, Melusine was subsequently featured in medieval tales across Europe, variously depicted as a mermaid, a water sprite, a fairy queen, a fairy princess, a dragon princess, and a forest nymph. She came to represent any magical creature who marries a mortal man. Most royal houses in Europe have claimed lineage to the real Melusine, so she has been the subject of great speculation. Legends about Melusine and Rainfroi (or Raymond) also often have a connection to boars and boar hunting. Melusine is known best in Magickal mythology as a Nixie, or Mermaid, with a Serpent tail or fish tail; however the Name Melusine is mentioned in “Charge of the Goddess” along with the names of Athene, Bride, Astarte and other goddesses as Names of Diana, Queen of All Witcheries. Many intriguing legends surround Melusine, who sometimes appears with wings, and is believed to be a beautiful, enchanting but potentially dangerous Spirit, living in and around fresh water springs and streams. Melusine (or Melusina) is a figure of European legends and folklore, a feminine spirit of fresh waters in sacred springs and rivers. 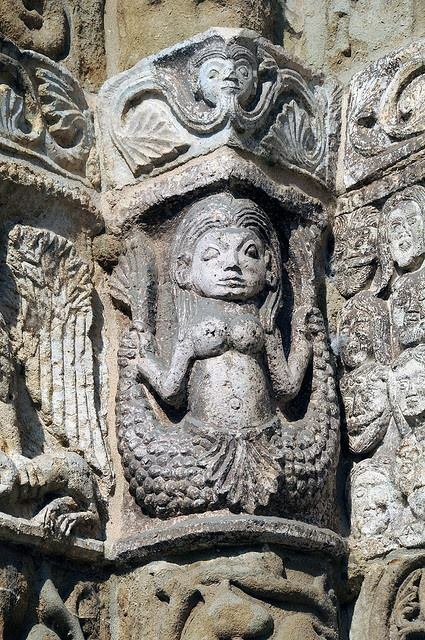 She is usually depicted as a woman who is a serpent or fish (much like a mermaid) from the waist down. She is also sometimes illustrated with wings, two tails or both. Melusine is sometimes used as a heraldic figure, typically in German and Scandinavian Coats of arms, where she supports one scaly tail in each arm. She may appear crowned. The Coat of Arms of Warsaw features a siren (identified in Polish as a syrenka) very much like a depiction of Melusine, brandishing a sword and shield. She is the water-spirit from the Vistula who identified the proper site for the city to Boreslaus of Masovia in the late 13th century. Ferenc Frangepin, Archbishop of Kalocsa in Hungary, included in his will of 1543 a series of seven tapestries representing the story of "The Beautiful Melusina." It tells how Elynas, the King of Albany (a poetical euphemism for Scotland) went hunting one day and came across a beautiful lady in the forest. She was Pressyne, mother of Melusine. He persuaded her to marry him but she agreed, only on the promise — for there is often a hard and fatal condition attached to any pairing of fay and mortal — that he must not enter her chamber when she birthed or bathed her children. She gave birth to triplets. When he violated this taboo, Pressyne left the kingdom, together with her three daughters, and traveled to the lost Isle of Avalon. The three girls — Melusine, Melior, and Palatyne — grew up in Avalon. On their fifteenth birthday, Melusine, the eldest, asked why they had been taken to Avalon. Upon hearing of their father's broken promise, Melusine sought revenge. She and her sisters captured Elynas and locked him, with his riches, in a mountain. Pressyne became enraged when she learned what the girls had done, and punished them for their disrespect to their father. Melusine was condemned to take the form of a serpent from the waist down every Saturday. 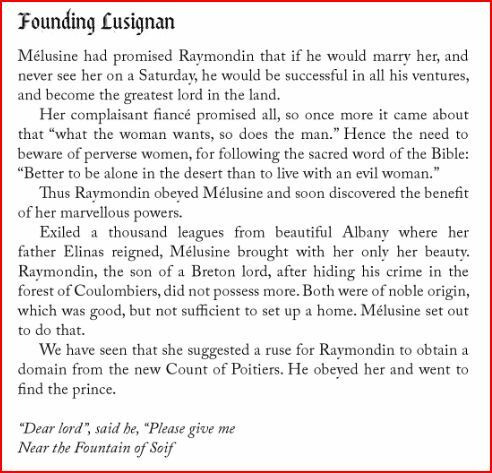 Raymond of Poitou came across Melusine in a forest in France, and proposed marriage. Just as her mother had done, she laid a condition, that he must never enter her chamber on a Saturday. He broke the promise and saw her in the form of a part-woman part-serpent. She forgave him. Only when, during a disagreement with her, he called her a "serpent" in front of his court, did she assume the form of a dragon, provide him with two magic rings and fly off, never to return. Melusine myths are especially connected with the northern, most Celtic areas of Gaul and the Low Countries. Sir Walter Scott told a Melusine tale in Minstrelsy of the Scottish Border (1802 -1803) confident that "the reader will find the fairy of Normandy, or Bretagne, adorned with all the splendour of Eastern description. The fairy Melusina married Guy de Lusignan, Count of Poictou, under condition that he should never attempt to intrude upon her privacy. She bore the count many children, and erected for him a magnificent castle by her magical art. Their harmony was uninterrupted until the prying husband broke the conditions of their union, by concealing himself to behold his wife make use of her enchanted bath. Hardly had Melusina discovered the indiscreet intruder, than, transforming herself into a dragon, she departed with a loud yell of lamentation, and was never again visible to mortal eyes ; although, even in the days of Brantome, she was supposed to be the protectress of her descendants, and was heard wailing as she sailed upon the blast round the turrets of the castle of Lusignan the night before it was demolished." When Count Siegfried of the Ardennes bought the feudal rights to Luxembourg in 963, his name became connected with the local version of Melusine. In 1997 Luxembourg issued a postage stamp commemorating this Melusina, with essentially the same magic gifts as the ancestress of the Lusignans. This Melusina magically made the castle of Bock appear the morning after their wedding. On her terms of marriage, she too required one day of absolute privacy each week. Alas, Sigefroid, as the Luxembourgeois call him, "could not resist temptation, and on one of the forbidden days he spied on her in her bath and discovered her to be a mermaid. When he let out a surprised cry, Melusina caught sight of him, and her bath immediately sank into the solid rock, carrying her with it. Melusina surfaces briefly every seven years as a beautiful woman or as a serpent, holding a small golden key in her mouth. Whoever takes the key from her will set her free and may claim her as his bride." Melusine is one of the pre-Christian era water-faeries who were sometimes responsible for changelings. The "Lady of the Lake", who spirited away the infant Lancelot and raised the child, was such a water nymph. For other European water sprites dangerous to humans, especially men, see Lorelei, Nixie. Escil·la, relleu d'una urna etrusca, Boston Skylla, Etruscan urn, Late 3rd century B.C., Museum of Fine Arts, Boston. This object is one of five ash urns found in a tomb of the Velsi family of ancient Chiusi. On the urn's front is a Skylla, a winged marine monster with the torso of a young woman and coiled fishtails instead of legs. Many Etruscans believed that the journey to the Underworld involved a dangerous sea voyage. In the ancient stories the tale of Melusine (sometimes Melusina) is spoken in reference to a water fairy who was stricken with a condition of being half-woman and half-fish (or serpentine) every Saturday. The tales were fabled to have started around spinning wheels, meaning that women were gossiping and telling stories while working. As the story went, for long as Melusine's husband didn't see her on that one particular day of the week, all would fair well for everyone. As most fairy tales or legends usually go, nothing ever goes according to plan. Melusine, the daughter of Pressina a full-fledged water fairy and the daughter of a mortal man, King Elinas (or King Helmas) wasn't always a mermaid/serpentine creature. According to the myth and legend stories, she was stricken with this ailment or condition after her mother found out what Melusine did to her father, King Elinas. King Elinas had met Pressina at the "fontaine de la soif" (Fountain of Thirst) and fell madly in love with her instantly. He then asked for her hand in marriage. Pressina agreed to marry the king under the condition that he never enter into her chambers during or just after childbirth. Shortly after the marriage she became pregnant with triplets and soon thereafter gave birth to three daughters Melusine, Melior, and Plantina. King Elinas' curiosity got the best of him after his elder son (from a previous marriage) insisted that he go in and see his wife and new babies. Pressina was so overcome with sadness because her king had broken his promise, that she takes the babies and runs away off to a hidden island, Cephalonia. When the daughters are teenagers, Pressina takes the girls to look upon their father's realm. She tells the girls about the promise their father broke and Melusine decides to seek revenge against her father. She convinces her two other sisters to help her kidnap their father and imprison him inside of a mountain. Once Pressina finds out about this, she becomes very upset and punishes Melusine by telling her that she will become a half-fish/serpent creature every Saturday for the rest of her life. Melusine goes on living in the forest until one day she stumbles across Raymondin,-Count of Anjou (some stories say Duke of Aquitaine), who had been very distressed due to accidentally killing his uncle during a boar hunt. He was unsure what to do, and since having come across Melusine, she promised him that she help him obtain riches, wealth and power to which he could never imagine and offered advice how to go about explaining the accidental death he caused of his uncle to his family. The new found companion he found in her, helped ease his grief. He was so pleased with Melusine's help that he asked her to be his bride. She agreed under one condition, that he could not see her in her chambers on Saturdays, no matter what. He agreed to the silly request and they were married at once. Melusine helped him gain power to the kingdom and build up the city of Poitou and newly built Lusignan, where Melusine became the mother of the Lusignan line. She even had the castle built in Lusignan and ruled over the land graciously and lovingly to her people. Over time the happy couple had in upwards of at least 10 children (most of which were born with a deformity of some sort). 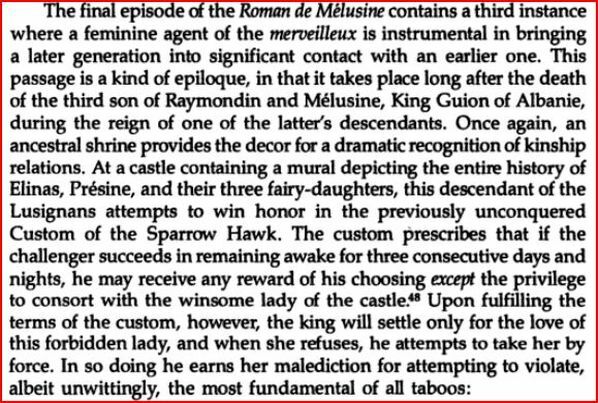 It was obvious due to the time span of so many children being born that they had been married for at least 10 years or more when Raymondin became pressured by family members about Melusine's odd Saturday activities. It became more curious when they mentioned that she didn't like to attend Mass at their Cathedral and Raymondin started wondering what she may be doing in her chambers by herself. In a fit of jealousy (thinking she may also be cheating ) he peeked through the keyhole in the door to her chambers and sees her bathing in a tub. She appeared as beautiful as ever from the waist up, but from the waist down her fish or serpent-like body splashed around with a fierce tail. Raymondin couldn't believe his eyes but never did he mention this to anyone until their son Geoffrey burned down the Church. He felt that Geoffrey was a bad soul and had perhaps inherited it from his wife, Melusine. He then accused her of being a "Faulse Serpente." 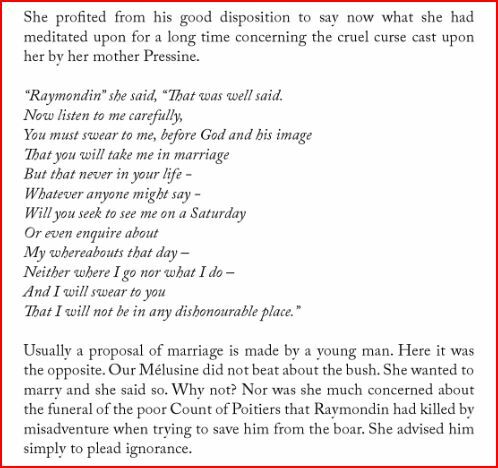 Melusine then is so distraught over the fact that Raymondin not only knew of her secret, thus he broke his promise, but also that he announced it to everyone of what she really was. Some books say Melusine then turned into a serpentine creature or dragon and flew away, while I read another state she jumped out the window in her fish-like state and swam away into the river. She was said to visit her children in the night in human form but other stories claim that she was a bad omen, for if you saw her flying around crying out that meant an impending death in the land. In French history, many royals all the way back to the days of Charlemagne have claimed to have descended from Melusine's family lineage. In fact, the Plantagenet families, Angevin lineage and the House of Anjou and Vere still claim lineage that date back to the story of Melusine. A melusine or mermaid in the facade of San Michele, Pavia, Italy. In 719 Charles Martel defeated Rainfroi de VER, Duke of Anjou and Mayor of the Palace of Neustrie. This victory brought back together key houses of the Franks under one rule and is considered an important date in European history. Rainfroi de VER (also known as Raymond) was married to another legendary character, Melusine. In this story Melusine's mother was a Presine fairy who charmed Elinas, the king of Scotland. The result was their daughter Melusine. 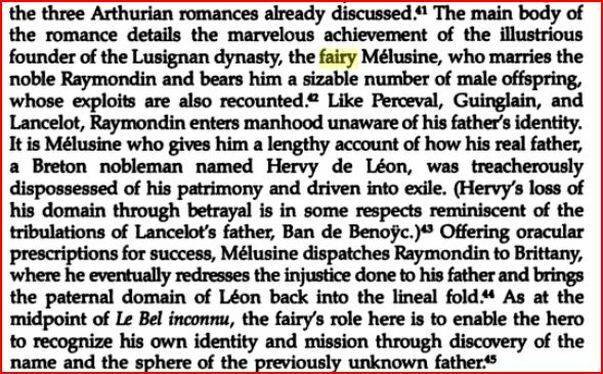 Half fairy and half princess, Melusine wandered over to the Continent and eventually met up with Rainfroi/Raymond in the forests Anjou. They met while he was out boar hunting. Overcome with her beauty, he took her hand in marriage, and many adventures ensued. As a result of this book, Melusine was subsequently featured in medieval tales across Europe, variously depicted as a mermaid, a water sprite, a fairy queen, a fairy princess, a dragon princess, and a forest nymph. She came to represent any magial creature who marries a mortal man. Most royal houses in Europe have claimed lineage to the real Melusine, so she has been the subject of great speculation. 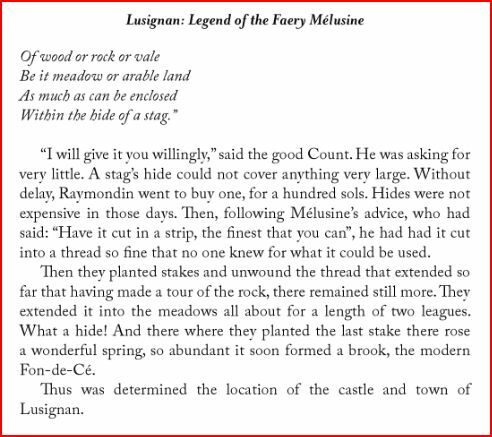 Legends about Melusine and Rainfroi (or Raymond) also often have a connection to boars and boar hunting. Charles Martel went on to become Duke of all the Franks and founder of Carolinian line of Kings. Thirteen years later in 732 he defeated the Saracen Army at Poitiers in France, and saved Western Europe from complete invasion by the Moslems. As a result of this, his son Pepin III, became 1st King of the Franks. Pepin in turn was the father of Charlemagne and Berta. Charlemagne, 2nd King of the Franks, is the ancestor of every existing and former ruling house or dynasty in Europe. His sister Berta was joined in marriage to the son of Rainfroi de VER, Milo de VER in 800 AD, the same year her brother was crowned Holy Roman Emperor. Milo de Ver was the Duke of Anjou, Count of Angleria, and Duke Leader of Charlemagne's house. Milo and Berta had two sons, one being Roland (legendary Paladin for whom "Song of Roland" was written) and Milo de VER II. The de Ver line passed from Milo II through a succesion of Earls of Genney: Milo II 's son Nicasius de VER was father to Otho de VER, father to Amelius de VER, father to Gallus de VER, father to Mansses de VER, father to Alphonso de VERE (Alphonsus) . Alphonsus de VERE, Earl of Genney, was "Councilor to Edward the Confessor" King Edward III of England, who had both Norman and Flemish advisors. Alphonsus de VERE had a son Alberic de VERE, also known as Aubrey I. NOTE: Aubrey comes from the Teutonic name Alberic, or "elf-ruler." Born sometime before 1040, Alberic de VERE (Aubrey I) came to England with William the Conqueror from Normandy in 1066, was one of King William's most favoured knights, and after the battle of Hastings, Alberic held land and lordships in many counties, including Middlesex where he owned Kensington and Earls Court. His wife was Beatrix, daughter of Henry Castellan, of Baurbough (some accounts say she was William the Conqueror's sister) by whom he had a daughter and five sons, Alberci (Aubrey de VERE II), Geffery, Roger, Robert an William. He used the motto,"Albri Comes" which which has been interpreted "Albery of truth cometh." He was alternately known as Alberic (Latin), Aubrey, Aberica Senior, Albri, Albertic, Albery, Aubri, Albury, and Alphonsus (in Greek). This Aubrey I, took the habit of a monk; and was buried in the church of Colne priory, which he had founded. Alberic de VERE the Second (Aubrey II), born in 1062 and also known as "Ablecricus, Junior," was successor to his father and became so much in favor with King Henry I. that he was not only made great "Chamberlain of England" but also "Justiciar of England" or Justice of All England. Aubrey II built a huge castle at Hedingham c.1140 using the Archbishop of Canterbury as his architect. On May 15 in 1141, he was killed in London in a riot and buried in Colne Priory. Alberic de VERE the Third (Aubrey III), born circa 1110, succeeded his father. During this time there was much turmoil in England, including a conflict between the Empress Maud, daughter of Henry I and King Stephen. It was really a fight between Normans and Flemings for the English throne. Since Stephen's wife was the Flemish Matilda, Countess of Boulogne, those Flemings already in England naturally flocked to her side. Aubrey III with ties to both the Flemings and the Normans, seemed to have played both sides. Empress Matilda (Maude) frequently came to Hedingham Castle as a visitor and guest of de Vere, and it was here that she was cornered by King Stephen, escaping out of the castle by a rope. The other Matilda, Queen and wife of King Stephen, and Flemish, was another regular visitor to Hedingham, and she died there on the 3rd May 1152, and was later buriedat Faversham Abbey, Kent. Eventually Aubrey III sided with the Norman Matilda/Maude and her son Henry II. Once Maude took control of the throne and became Empress, "in order to engage him to her interest" confirmed to Aubrey the office of great Chamberlain, all of his father's estates, along with other inheritances such as the earldom of Cambridge, Oxford, Berkshire, Wiltshire, and Doreseshire, which Maud's son, Henry II, confirmed this, constituting him Aubrey 1st Earl of Oxford. Illuminated letters, Tale of King Arthur & Mermaid. We know the name of the European hydrologic goddess; Melusine. She inhabits the locals of sweet water wells and springs. Alternatively, she is called a mermaid or the Dragon Princess and legends say she is half human and half dragon/fish/snake. The lineage of Merovingian kings claim her as progenitress and gave them their right to rule. The etymology of her name is disputed but may be related to melit which means sweet and is also related to the Greek word for honey. The Merovingian line is choc full of legends that pass for history and so nothing more can be learned about the Serpent/Dragon Goddess that can be trusted. Also, the etymology of the word dragon is not at all helpful. It is supposedly from a Greek word that means good eyesight and has no known cognates which is extremely unusual. Both Pressina and her daughter Melusine in their turns served as "fountains" or Grail Maidens, until they were in their marriageable prime, as Dragon Queens, capable of bearing children without too many complications. Gille Sidhean, Pressina’s husband, and Raymond, Melusine’s husband, and both the women themselves, all had comparable Vere descent. Clearly, the men were related to their spouses, by blood, race or name. Raymond de Verrieres, or Ver-en-Forez, Lord of Pictavia and Anjou, had the Druidic Blue Boar as his family badge. Pictavia was founded by Melusine’s maternal forefathers, the Ver Kings of the Danaan remnant, and so the assertion as fact that the House of Vere, The First Royal House of Anjou, was of the pure elven, Royal Dragon Blood appears inescapable. Much to the annoyance of the church and its chroniclers, who appear to have attempted to eclipse the pure origins and thus the genuine sovereign status of the Royal House of Vere by various means, as they did with many other Royal Dragon families of the Sang Real and the San Graal. For the Dragon and the Grail, for the Vere it is of some considerable importance that we maintainour royal status and assert our Elven, Dragon origins. Raymond de Vere, Count of Anjou, alias Rainfroi de Vere, married, in 733, Melusine de Lusina. She was the daughter of Elinas, King of the Picts, and Bruithina MacBrude, and, thus, was a princess of the southern Picts of Alba. Her totem tribal badge was the Dragon, hence the fairytale connotations. The Dragon Motif was depicted in 1200 AD. on the seal of Hugh de Vere, whilst the Blue Boar, a Druidic caste badge, was [n.b.] derived from the family of Raymond de Vere. Their son was Count Maelo de Vere, commander of Emperor Charlemagne's army. From Maelo's own marriage to Charlemagne's sister, Bertha Martel, sprang a succession of Earls of Genney. Maelo's brother was Roland, for whom "Song of Roland" was written. 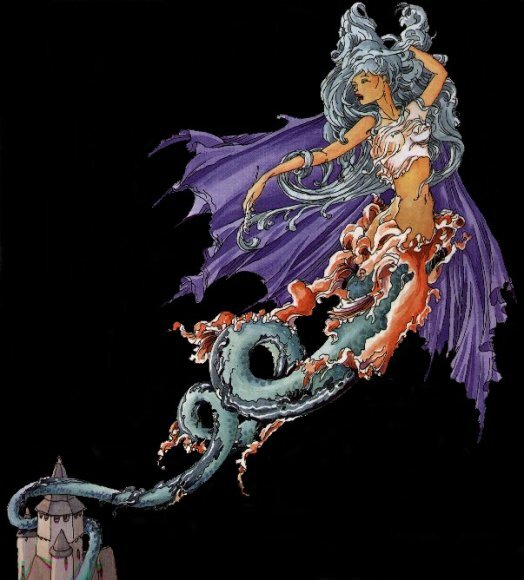 In the Arthurian and Magdalene traditions of the Ladies of the Lake, Melusine was a fountain fey - an enchantress of the Underwood. Her fountain at Verrières en Forez was called Lusina - meaning Light-bringer - from which derived the name of the Royal House of Lusignan - the Crusader Kings of Jerusalem. The Fount of Melusine was said to be located deep within a thicket wood in Anjou. She was also known as Melusina, Melouziana de Scythes, Maelasanu, and The Dragon Princess. The Melusine story is a powerful initiatory legend emerging from the deeply transformative Faery Tradition of ancient Europe. There had always been a Melusine back and back beyond the reaches of time. Such legends manifest as history: the innate sacromagical power of Melusine affected key places and events in the development of the medieval world and from there reached far into the shaping of the modern world through the conflicts for Jerusalem and the Middle East. Melusine de VERE appeared in the book Roman de Melusine written in 1393 by Jean d'Arras. The story is a mix of fiction and fact, commissioned by the Duke de Berry, a French noble who was brother to King Charles V, and uncle of King Charles VI. It was meant to be a family history and to uphold the proprietary claims to Lusignan and Anjou. In this story Melusine's mother was a Presine fairy who charmed Elinas, the king of Scotland. The result was their daughter Melusine. Half fairy and half princess, Melusine wandered over to the Continent and eventually met up with Rainfroi/Raymond in the forests of Anjou. They met while he was out boar hunting. Overcome with her beauty, he took her hand in marriage, and many adventures ensued. As a result of this book, Melusine was subsequently featured in medieval tales across Europe, variously depicted as a mermaid, a water sprite, a fairy queen, a fairy princess, a dragon princess, and a forest nymph. She came to represent any magial creature who marries a mortal man. This fay by enchantment built the castle of Lusignan for her husband. Most royal houses in Europe have claimed lineage to the real Melusine, so she has been the subject of great speculation. Charles Martel went on to become Duke of all the Franks and founder of Carolinian line of Kings. Thirteen years later in 732 he defeated the Saracen Army at Poitiers in France, and saved Western Europe from complete invasion by the Moslems. As a result of this, his son Pepin III, became 1st King of the Franks. Pepin in turn was the father of Charlemagne and Berta. Charlemagne, 2nd King of the Franks, is the ancestor of every existing and former ruling house or dynasty in Europe. His sister Berta was joined in marriage to the son of Rainfroi de VER, Milo de VER in 800 AD, the same year her brother was crowned Holy Roman Emperor. 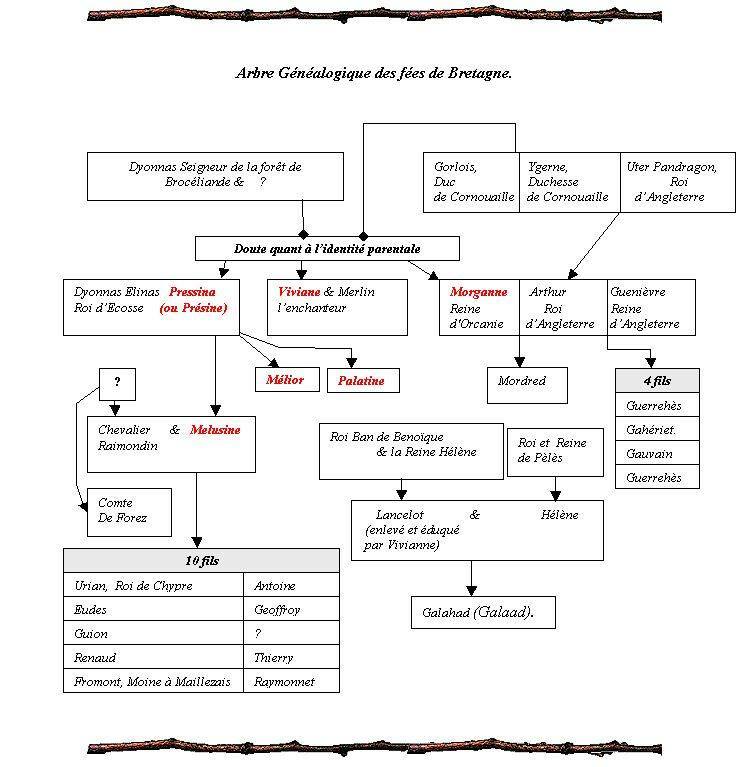 Then, the entire Merovingian line is transmitted to Plantagenets only through Eleanor of Aquitaine. The end of the Grail quest is the return to the source of life and rebirth into it as divinely self-conscious entities purified by involvement in earthly experiences and having also contributed to the ongoing process of cosmic evolution by refining our substance. The great lesson for Parzival -- for all of us because he is our prototype -- is the interconnected relationship of all earth entities. The bonds of a universal brotherhood make us all kin. The suffering of one hurts all, and compassion in our heart obliges us to ask forever: What ails our brother? 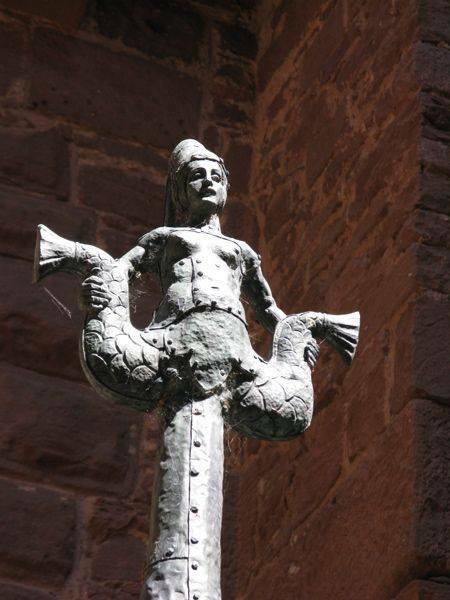 Germanic Melusine located at Alsace on border between France and Germany. One of history's best known Grail fairies was Princess Melusine, daughter of the Pictish King, Elinas of Alba - a descendant of the 2nd-century King Vere of Caledonia, Lord of the Dragon. In the year 733, Melusine (maintaining the family heritage) married Rainfroi de Vere, Prince of Anjou, and among their offspring was Count Maelo, the commander of Emperor Charlemagne's army. From Maelo's own marriage to Charlemagne's sister, sprang the Vere Counts of Guisnes who, as previously mentioned, were the reputed Elf-kings and became England's Great Chamberlains and Earls of Oxford. In the Arthurian and Magdalene traditions of the Ladies of the Lake (as discussed in Bloodline of the Holy Grail), Melusine was a 'fountain fey' - an enchantress of the Underwood. Her fountain at Verrières en Forez was called Lusina (meaning 'light bringer'), from which derived the name of the Royal House of Lusignan - the Crusader Kings of Jerusalem. The Fount of Melusine was said to be located deep within a thicket wood in Anjou, and she was often depicted as a mermaid, as she is still beguilingly portrayed in an old painting at Count Dracula's Bran Castle in Romania. taking up arms against King John. It was he who, subsequently styled Robin Fitzooth, became a prototype for the popular tales of Robin Hood. Of all the monarchs who ever sat upon the Throne of England, the Tudor Queen, Elizabeth I, was by far the most in tune with ancient cultures and wood lore. She was even called the 'Fairie Queen' and, before being formally crowned, she was installed by the people as their Queen of the Greenwood. This was an ancient ritual of the Shining Ones - the elven race of the Albi gens. The ceremony was conducted in the mist of early dawn in the depths of Windsor Forest and, to facilitate the installation, the customary Robin Hood legacy of the House of Vere was brought into play. At that time the Queen's Lord Chamberlain was Edward de Vere of Loxley, 17th Earl of Oxford, and it was his office to invest Elizabeth by first deposing the Caille Daouine. This was the traditional King of the Forest (whose name had given rise to Scotland's Pictish realm of Caledonia) - the mighty Stag of the Seven Tines, upon whose back Lord Vere rode into the ceremonial clearing. the works of their playwright colleague, William Shakespeare. As mentioned in connection with Melusine, fountains, springs and water in general were always associated with the Ring Lord female line. This stems from the very earliest times of the Anunnaki, whose founding mother (as explained in ancient Mesopotamian literature) was Tiâmat the sea-dragon. In later times these queens were commonly represented as mermaids (mere maids), and were often called Ladies of the Lake. This was a style granted to Mary Magdalene when she had settled in Provence from AD 44.
document made special mention of his descent from the Queens of Avallon. The mother of Melusine is called Pressine. This prohibits the father to see his children breastfeed. This means that the father does not live in the family of the mother and does not share his family privacy. If he violates this prohibition, it is enclosed in a lost island. It therefore has no right or duty to his children. Worse, they are his children who do not recognize any right because they are his daughters that trap: they do not want just as a father. He has no power over them, but they have on him. The power to reject absolutely. 1. Being winds. But it already was! This is the power of the Mother Goddess of the origins flying through the skies in serpentine form (energy) is the Goddess of the Sacred Sources and megaliths. 2. "You will take a normal life as a woman and wife." Curious normality when we know that the normality of the matriarchal family live without father and husband, where brothers and sisters live together all their lives and practice stealth union with an external lover, who does not live in house, and that does not matter. This "normal" is actually a real curse for the woman who is "wife" living with a "husband." However, women are putting conditions on these new contracts, these families of a new kind, where the husband and father appear. Firstly, women keep their religions. 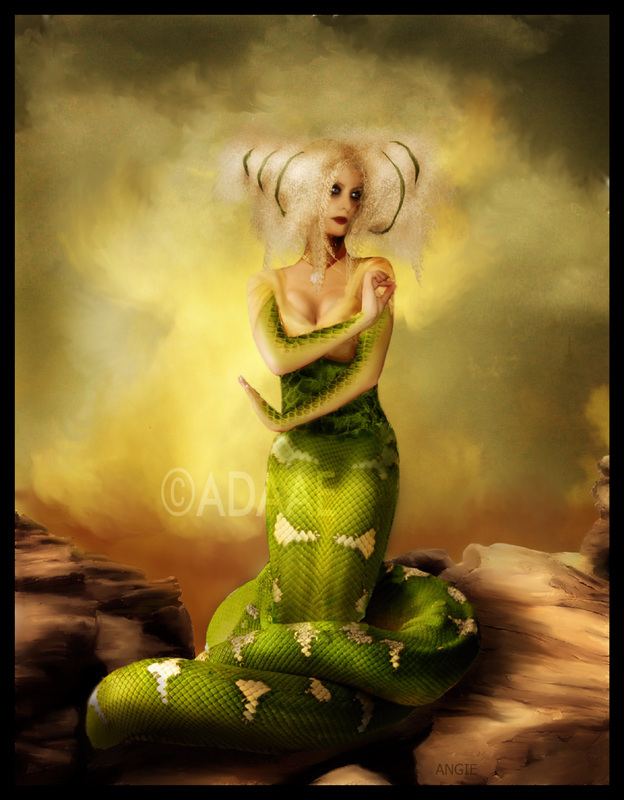 And Saturday is a holy day devoted to the Goddess Snake ablutions, secret rites reserved for women, high priestesses. The men are not allowed, which is symbolized by the ban on the husband to see his wife on Saturday because it is the day of worship of the serpent. Melusine is a high priestess, and the fact that she married a man is not only harmful to the privacy of the matriarchal family, but this excursion takes an even more dangerous turn as man tries to include not only matriarchal family home, but also in the priesthood and the cult of the snake, originally reserved only for women in elected and initiated. He had to be something serious for the female to be so challenged. But for now, the woman has not lost everything and keeps control of his powers by putting his conditions. Because if there is betrayal, transgression, interference of the new male power in the secret rites, since the pact is broken and the woman returns to reign alone in its absolute and indivisible power of winged snakes. And marriage keeps he still his stealth and insignificant side, it is definitely not sealed, and it is the woman who breaks immediately when it considers that the contract is broken. The man has not yet totally pulled it off. He will have to patient even a few hundred years for stealing his name to the woman, steal her children, rob his worship. However, the man has already committed the irreparable and became very dangerous. For indeed, it was from the hunting weapon to kill humans. And indeed, a young hunter, Raymondin, and his maternal uncle who taught (the Count of Poitiers), go hunting in the woods and swamps. In matriarchal families, it is indeed the brother of the sister who educates his children because there is no father and the latter, even if sometimes knows his children, has no right or duty to them. The nephew is it benevolent towards uncle, being his heir in title? For in fact, men have already taken the land of women to defend and manage on their behalf. The Celtic invasions took place and the men rush to grab land increasingly large, base their powers wrens. The symbolic animal of the Gauls (or Celtic) is the wild boar, wild boar hunting, which lasts several days, could be a hunting Gallic invaders. And the hunt ends badly for Uncle course. Why? Because under the guise of an unfortunate hunting accident, wanting to kill the big boar Raymondin kills his uncle and thus inherits all its lands. Indeed, at that time, the maternal nephew who inherits land uncle, not the children's uncle (who also does not live with him but with their mother in another matriarchal family) . Because the land in the past belonged to the women who managed collectively, and their transmission always goes through them. The man is king, but his mother or his sister. Man inherits, but the woman. Children's rights are not held in an account at a succession. The children of the sister of the king are the legitimate heirs and even if the kings begin to live with their wives and their children also, these unions are still considered very stable. Raymondin seems a little hero, paid for his crime with a powerful character, the new Count of Poitiers. It receives only a vassal stronghold, which the prophetess Melusine tells her he will be determined by the perimeter obtained by a deerskin cut into thin strips assembled. As in many stories around the world, the fairy agrees to marry Raymondin, conditionally. And during her marriage, she not only gives him 10 children, but 8 are monstrous, as is often the children born of the Gods (one has three eyes, the other one, the other a lion's paw on cheek, etc.. totem animals?). More importantly, between pregnancies, Tinker carries huge stones by air to build towers, castles, chapels, churches, abbeys cyclopean size and all the megaliths in the region. His madness construction extends from the Aquitaine Poitou Charentes passing by. A stronghold and a rather worthy of a kingdom, not a huge tower that claims to have been built by the Fairy much larger territory. The inclusion of megaliths clearly announces that references the tale, passed down orally before undergoing the pen of Jean d'Arras or Couldrette the fourteenth and fifteenth centuries, dating back to the beginning of time directed by the Civilization of the Great Goddess, the one where huge stones were erected without being able to explain how even today. More serpentine fairy, tapping his heel creates amount of springs, wells and rivers. In ancient times, the sources were of a sacred character, and they found a cave filled with statues of devotions to the Sequana Nymph at the source of the Seine (the votive shrines sources of the Seine are now exposed Archaeological Museum of Dijon). Sources were considered miraculous healing or. Melusine and never misses the ritual bath on Saturday in which it is serpentine woman. The woman doctor of antiquity had control of the snake she held well in hand. It symbolized the energies of Mother Earth. The Snake is a powerful symbol of healing! In ancient Greece, the god of medicine, Asclepius (Aesculapius) was the Serpent attribute. In temples dedicated to him, including at Epidaurus, the oracle was delivered through snakes, snakes found elsewhere wrapped around the caduceus. Melusine and keeps prophesy! She predicted Raymondin his immediate future: how it will assign a fief by the Count of Poitiers with a deerskin, how her wedding will take place, how it should go on Britain to claim his land. It employs a future certainty, its ads are prophetic. It is characteristic of the Fairies (Latin fata: the destinies, fatum: divine utterance). The Lusignan family originated in Poitou near Lusignan in western France in the early 10th century. By the end of the 11th century, they had risen to become the most prominent petty lords in the region from their castle at Lusignan. In the late 12th century, through marriage and inheritance, a cadet branch of the family came to control the Kingdoms of Jerusalem and of Cyprus, while in the early 13th century, the main branch succeeded in the Counties of La Marche and Angoulême. As Crusader princes in the Latin East, they soon had connections with the Hethumid rulers of the Kingdom of Cilicia, which they inherited through marriage in the mid-14th century. The Armenian and Cypriot branches of the family eventually merged and the dynasty died out after the Ottoman conquest of their Asian kingdoms. The Château de Lusignan, near Poitiers, was the principal seat of the Lusignans; it was destroyed during the Wars of Religion, and only its foundations remain in Lusignan. According to legend the earliest castle was built by the folklore water-spirit Melusine. The lords of the castle at Lusignan were counts of La Marche, over which they frequently fought with the counts of Angoulême. Count Hugh le Brun ("Hugh the Swarthy"), like most of the lords of Poitou, backed Arthur of Brittany as the better heir to Richard Lionheart when John Lackland acceded to the throne of England in 1199. Eleanor of Aquitaine traded English claims for their support of John. To secure his position in La Marche, the widowed Hugh arranged a betrothal with the daughter of his next rival of Angoulême, no more than a child; John however married her himself, in August 1200, and deprived Hugh of La Marche and his brother of Eu in Normandy. The aggrieved Lusignans turned to their liege lord, Philip Augustus, King of France. Philip demanded John's presence— a tactical impossibility— and declared John a contumacious vassal. As the Lusignan allies managed to detain both Arthur and Eleanor, John surprised their unprepared forces at the castle of Mirebeau, in July 1202, and took Hugh prisoner with 200 more of Poitou's fighting men. King John's savage treatment of the captives turned the tide against himself, and his French barons began to desert him in droves. Thus the Lusignans' diplomatic rebellion led directly to the loss of half of England's French territory, which was soon incorporated into France by Philip Augustus (The other "half", Aquitaine, was the possession of Eleanor, who was still alive). The Lusignans were among the French nobles who made great careers in the Crusades. An ancestor of the later Lusignan dynasty in the Holy Land, Hugh VI of Lusignan, was killed in the east during the Crusade of 1101. Another Hugh arrived in the 1160s and was captured in a battle with Nur ad-Din Zangi. In the 1170s, Amalric arrived in Jerusalem, having been expelled by Richard Lionheart (at that point, acting Duke of Aquitaine) from his realm, which included the family lands of Lusignan near Poitiers. Amalric married Eschiva, the daughter of Baldwin of Ibelin, and entered court circles. He had also obtained the patronage of Agnes of Courtenay, the divorced mother of King Baldwin IV, who held the county of Jaffa and Ascalon and was married to Reginald of Sidon. He was appointed Agnes's constable in Jaffa, and later constable of the kingdom. Hostile rumours alleged he was Agnes's lover, but this is questionable. It is likely that his promotions were aimed at weaning him away from the political orbit of the Ibelin family, who were associated with Raymond III of Tripoli, Amalric I's cousin and the former bailli or regent. Amalric's younger brother, Guy, arrived at some date before Easter 1180. When he arrived is quite unknown, unless we accept the statement of Ernoul that he arrived at this precise juncture on Amalric's advice. Many modern historians believe that Guy was already well established in Jerusalem by 1180, but there is no contemporary evidence to support this belief. What is certain is that Amalric of Lusignan's success facilitated Guy's social and political advancement. Older accounts (derived from William of Tyre and Ernoul) claim that Agnes was concerned that her political rivals, headed by Raymond of Tripoli, were determined to exercise more control by forcing Agnes' daughter, the princess Sibylla, to marry someone of their choosing, and that Agnes foiled these plans by advising her son to have Sibylla married to Guy. However, it seems that the King, who was less malleable than earlier historians have portrayed, was considering the international implications: it was vital for Sibylla to marry someone who could rally external help to the kingdom, not someone from the local nobility. With the new King of France, Philip II, a minor, the chief hope of external aid was Baldwin's first cousin Henry II, who owed the Pope a penitential pilgrimage on account of the Thomas Becket affair. Guy was a vassal of Richard of Poitou and Henry II, and as a formerly rebellious vassal, it was in their interests to keep him overseas. Guy and Sibylla were hastily married at Eastertide 1180, apparently preventing a coup by Raymond's faction to marry her to Amalric of Lusignan's father-in-law, Baldwin of Ibelin. By his marriage Guy also became count of Jaffa and Ascalon and bailli of Jerusalem. He and Sibylla had two daughters, Alice and Maria. Sibylla already had one child, a son from her first marriage to William of Montferrat. An ambitious man, Guy convinced Baldwin IV to name him regent in early 1182. However, he and Raynald of Châtillon made provocations against Saladin during a two-year period of truce. But it was his military hesitance at the siege of Kerak which disillusioned the king with him. Throughout late 1183 and 1184 Baldwin IV tried to have his sister's marriage to Guy annulled, showing that Baldwin still held his sister with some favour. Baldwin IV had wanted a loyal brother-in-law, and was frustrated in Guy's hard-headedness and disobedience. Sibylla was held up in Ascalon, though perhaps not against her will. Unsuccessful in prying his sister and close heir away from Guy, the king and the Haute Cour altered the succession, placing Baldwin V, Sibylla's son from her first marriage, in precedence over Sibylla, and decreeing a process to choose the monarch afterwards between Sibylla and Isabella (whom Baldwin and the Haute Cour thus recognized as at least equally entitled to succession as Sibylla), though she was not herself excluded from the succession. Guy kept a low profile from 1183 until his wife became queen in 1186. Guy's term as king is generally seen as a disaster; he was defeated by Saladin at the Battle of Hattin in 1187, and was imprisoned in Damascus as Saladin reconquered almost the entire kingdom. Upon his release, his claim to the kingship was ignored, and when Sibylla died at the Siege of Acre in 1191, he no longer had any legal right to it. Richard, now king of England and a leader of the Third Crusade, supported Guy's claim, but in the aftermath of the crusade Conrad of Montferrat had the support of the majority of nobles. Instead, Richard sold Guy the island of Cyprus, which he had conquered on his way to Acre. Guy thereby became the first Latin lord of Cyprus. Amalric succeeded Guy in Cyprus, and also became King of Jerusalem in 1198. Amalric was responsible for establishing the Roman Catholic Church on Cyprus. The male line of the Lusignans in the Levant died out in 1267 with Hugh II of Cyprus, Amalric's great-grandson (the male line continued in France until 1308).